Animal mítico de la región guaraní de terrible aspecto. Es semejante a una oveja pero de grandes garras y devora a los que encuentra en el monte. La única salvación es subirse a una palmera, árbol sagrado que no se atreverá a profanar. Si el perseguido se trepa a cualquier otro árbol, el Ahó-Ahó lo derribará cavando con sus potentes uñas, para devorarlo ni bien caiga al suelo. Sospecha Ambrosetti que esta leyenda fue difundida por los padres jesuitas en las misiones del Alto Paraná para evitar que los guaraníes se alejaran de las reducciones, por temor a que desertaran, se perdieran en el monte o fueran victimados por los tigres o los indios no reducidos, que siempre merodeaban por los alrededores. 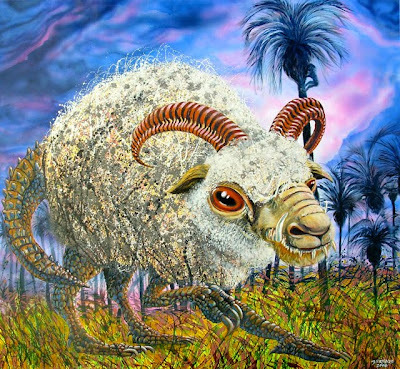 Mythical animal of the Guarani region of terrible aspect. It is similar to a sheep but of big claws and it devours those that he/she finds in the mount. The only salvation is to be gone up to a palm, sacred tree that won't dare to profane. If the one pursued you climbs to any other tree, the Ahó-Ahó will demolish it digging with its potent fingernails, to devour it neither well fall to the floor. Ambrosetti that this legend was diffused by the parents Jesuit in the missions of the High Paraná to avoid the Guarani to move away from the reductions fearing that deserted, suspects they got lost in the mount or they were killed by the tigers or the not reduced Indians that always marauded for the surroundings.